NEWPORT – More than 200 third- through 12th-graders will demonstrate their knowledge of wind-, wave- and solar energy on April 19 in the third annual Oregon Coast Renewable Energy Challenge at Oregon State University’s Hatfield Marine Science Center. The event takes place from 10 am to 2 pm. Students from Warrenton, Seaside, Tillamook, Toledo and Waldport will bring their student built renewable energy devices to compete for top honors at this year’s competition. In addition to testing their devices in wave tanks, solar tracks and in a wind tunnel, teams will interact with a panel of engineering judges who will further rate teams on knowledge and design innovation. Students will also have the opportunity to hear about current research on potential impacts of offshore wind energy devices, and participate in HMSC’s Sustainability Quest, an educational clue-directed hunt. This year’s Oregon Coast Renewable Energy Challenge is made possible by support from the Siletz Tribal Charitable Contribution Fund, Georgia-Pacific Foundation, Oregon Sea Grant, Oregon State University, and the Oregon Coast STEM Hub. 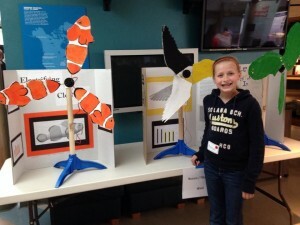 Teams with top wind energy devices will be invited to participate in the National KidWind Challenge in New Orleans at the end of May.